Make the marinade: Mix in a blender the garlic, rosemary, oil, lemon juice, honey, salt, pepper and mustard. Make deep cuts with knife at legs of lamb and rub it with marinade. 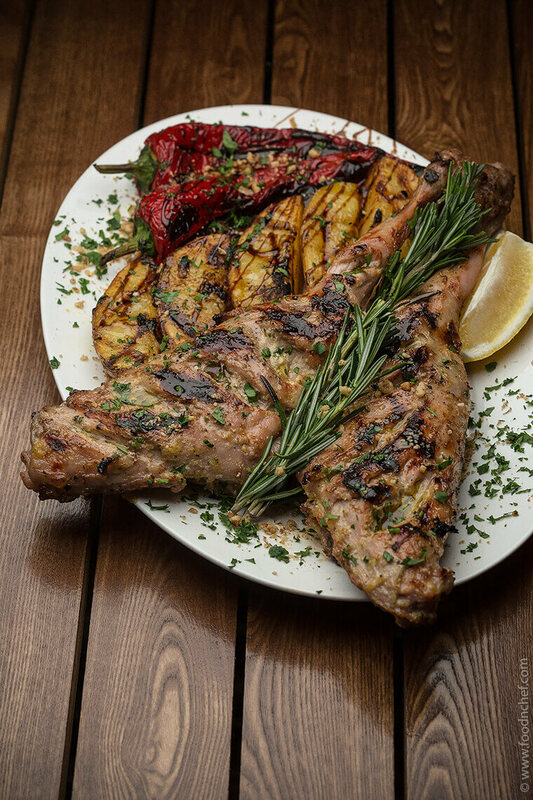 Wrap lamb with foil several times and put in a pre-heated to 300 degrees grill, and cook for 15 minutes each side. Near the lamb put the potatoes, cut into slices and greased with olive oil and seasoned with rosemary, salt, pepper, and wrapped in foil. 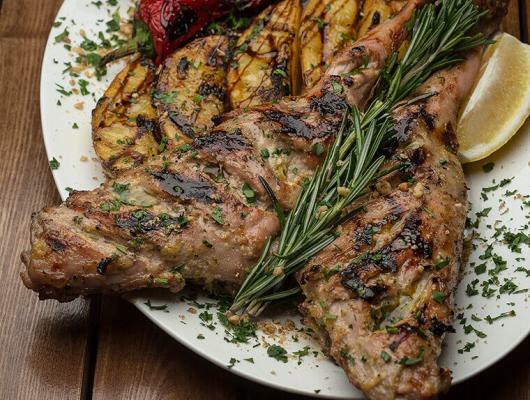 After 30 min get lamb with potatoes out of the grill, let them 15 minutes to cool without removing the foil. And meanwhile, put down the temperature of the grill to 180-200 degrees. When the leg and potatoes have cooled slightly, carefully remove the foil, but keep all the juices remaining in foil after cooking meat, potatoes peeled not necessary. Put the leg of lamb on the grill grate, thereby lubricating juice. Next lay out the potatoes and peppers, bake until cooked for 15 minutes, constantly oiling and glazing the meat. Remove from heat and let rest about 15 minutes. In a large serving dish lay out the potatoes and sweet pepper. Drizzle with olive oil lay rested meat on top (left whole or sliced) and sprinkle with crushed walnuts and finely chopped herbs mint and parsley. Garnish with fresh sprigs of rosemary and lemon and serve.